May 21, 2012: In an op-ed for Israeli news website, Ynet, Abed Al Rauf Abu Safar, a 55-year-old from Gaza writes about the restrictions that are imposed on sale of goods from Gaza to the West Bank and Israel and how this impacts both residents of the Gaza Strip and Israelis. 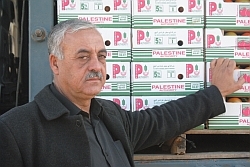 Abu Safar has exported tomatoes from Gaza to Saudi Arabia in the past, but says "profitability is limited because of shipping costs". "Not many in Gaza have had my luck", writes Abu Safar. "In five years without income generated from sale of goods, I have seen friends and colleagues shut down factories and lay off employees. Unemployment in Gaza is soaring. At the end of the day, you can't just buy products without manufacturing and selling. Most people cannot travel outside Gaza and work elsewhere. Even those who have permits, like me, are unable to create jobs as they have in the past and do not develop the markets in Gaza".